Runners may need to verify or determine the distance of a running track. Running tracks are oval-shaped and divided into individual lanes. The track is measured in meters based on the distance of the innermost lane, which is called lane one. Measuring the distance around the track is easy with a little preparation. Some devices measure the distance based on GPS, but using an old-fashioned measuring wheel provides the most accurate reading. Although measuring wheels are available in different sizes, medium-to-large wheels are the best for measuring a running track. Clear lane one of all debris. The measuring wheel needs to roll on a flat surface. Rolling the wheel over or around loose gravel and other objects will cause the reading to be slightly off. Mark the measure line of lane one at several points around the track. The measure line is located 20 centimeters from the inside painted line of each lane. If the inside of lane one is a raised curb, the measure line is 30 centimeters away from the running side of the curb. Stretch masking tape across the lane in multiple places along the track. Use the tape measure to find the 20-centimeter or 30-centimeter point, and use a black marker to mark the spot. Reset the counter of your measuring wheel to zero, and start with the wheel indicator at the beginning point on the track. Slowly go around the track, staying an equal distance from the lane, going through each of the points marked on the masking tape during setup. Stop once you reach the starting point. Check the reading on the display. This is the distance of the track. If the measuring wheel you are using is not metric, convert feet into meters by multiplying the number of feet by 0.3048. 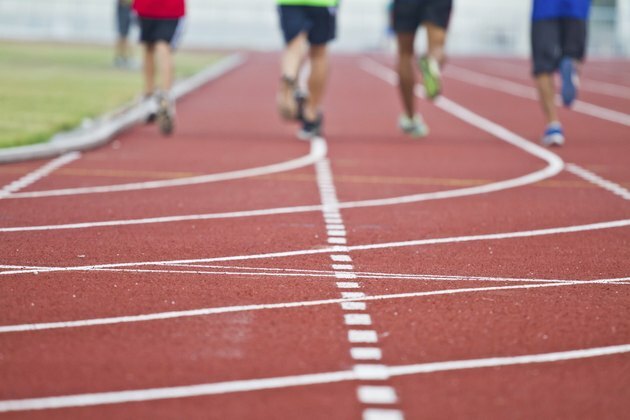 What Is the Distance Around a Running Track for Each Lane? How Many Revolutions Equal a Mile on a Nordic Track Elliptical?